Once again, your goal is to increase your effectiveness and efficiency at work by eliminating, as much as possible, time and effort that bring about little or no productivity. One of the most inefficient endeavors in existence, and one that most people don’t consider, is focusing on tasks that you are not good at. 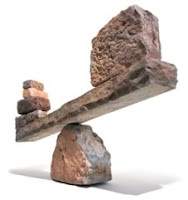 Many people mistakenly strive to achieve a balanced portfolio of strengths. They want to be well rounded, to eliminate their weaknesses. If they’re very good at crunching numbers, they focus on learning a new language. If they’re good at inspiring and leading people, they invest great gobs of time into developing their skills at designing spreadsheets. You’ve heard the phrase, Jack of all trades, master of none. This well describes the usual outcome of that sort of undertaking. The art of using leverage is one of the most powerful techniques in the universe. Archimedes is famously known to have said, “Give me a lever long enough and a fulcrum on which to place it, and I shall move the world.” In the context of this article, using leverage means making use of your strengths, as a fulcrum, to achieve things that would normally be impossible. Let me give you an example. Why do people run for the office of President of the U.S. when they and everyone else knows that they have no chance of winning? They do it in order to gain name recognition and a degree of celebrity. Why? To feed their needy egos? No, they do it in order to use their celebrity later on as leverage to sell books and command very lucrative speaking fees and become rich lobbyists. So ask yourself this: Am I leveraging my strengths to accomplish more than I ever thought possible, or am I kicking at the goads of my weaknesses in a vain attempt to transform them into strengths? In an earlier article I wrote about following your bliss, or doing what you love. What I’m advising here is that you do what you are good at, which, in many cases is what you love. A very happy coincidence when it happens, and it frequently does.